"The hand that rattles the Cage is the hand that rules the world..."
Lots of names can be overheard in the pubs and gutters of Sigil, but nobody really cares about them. A name on the Ring is little more than a distinguishing feature, like a scar or a fancy cloak, something to identify a basher. Some names are less identifying than others, 'Raph's, 'Nale's, and 'Martiken's are a green a dozen. But one name can usually be dropped anywhere within a stone's throw of a portal and be identifiable: Martiken Solitz. But don't trust the name or the reputation. The last time anyone checked, there were also a dozen or so 'Martiken Solitz's running around, not counting the real deal or the two score who've already ended up in the dead book. The problem is the name's famous, the guy isn't. Martiken never needs to worry about being recognised, because due to tavern talk, he supposedly stands 8'3", weighs about 300 pounds of solid muscle, and resides on Nessus, Mount Celestia, and Krynn, all at the same time. In truth Martiken is a small man, about 5'6", rather slight of build, pale-skinned, with unruly hair and an unassuming smile. Of all the berks running around with his name, you'd assume that the leather clad traveller with the twin greensteel broadswords was some hick from a tiefling village, or some kid of a Clerk's Ward high up, or anything but one of the premier plane-walkers of his day. But he is. A little less than thirty years ago, some tiefling imprisoned in the Abyss gave birth to a cambion's child. The fiend was the son of Graz'zt, chant goes, rumoured by some to be Rule-Of-Three himself (Martiken, when confronted with a question about their relation, will sheepishly smile and say "I should be so lucky." The cambion philosopher was quoted as saying "The boy is nothing like me save for thought, action, and motive.") The boy was highly valued for the planar energy inside him (it's rumoured that the magic in his swords is actually an extension of his aura, which would explain his fighting ability) and trained as a warrior almost from birth. He was rumoured to have slain his first fiend at the age of five, but that's just a rumour, after all. The only cold hard fact is that Martiken, having already become a great swordsman at a young age was liberated from the tanar'ri by the Desidarian. Some adventures of Burbank Ralopolis are detailed on the pages. Since then his actions have been lost in tall tales and vicious lies. Others impersonating him have performed more than one of the adventures attributed to him, and he has undoubtedly left his best tales untold. Those who know him personally (including Erin of the Sensates, who claims to know him very personally) identify him as an affable, well-tempered man, who always seems to be plotting something. All who have met him, even in passing, remark on his pure heart and his trusting manner. Martiken is the type of person who is very reactive, he explores new situations and then deals with them as he sees fit. Often, his motives place him in alliance with Clarion the Guardian, as Clarion will approach him with a situation, Martiken will investigate, and correct the situation. No side ever seems happy with the outcome, except for Martiken, but all those will accept that his actions, while pragmatic, are fair and equable. Martiken seeks to have all people well treated, and acts to do the greatest good for the greatest number. The Harmonium disapproves of him greatly, as he acts without reason or regard for the law, but he's well-loved by the Bleakers and Free-Leaguers, as he acts totally in accordance with his own conscience and nothing else. Even those who know and deal with him on a regular basis know little of him. He travels inconspicuously, and almost is never associated with his reputation. He is an amazing swordsman, and is usually considered the best (he's left a long line of carnage in his wake, and despite the many impostors, its rather easy to figure out who's real when the swords start to fly. Nobody, and I mean nobody, has ever even claimed to beat him). Also, his knowledge of the planes is unparalleled. He's done nothing but planewalking for the last fifteen years of his life, and in that time has discovered more pocket dimensions and hidden paths than anyone'd care to shake a stick at. 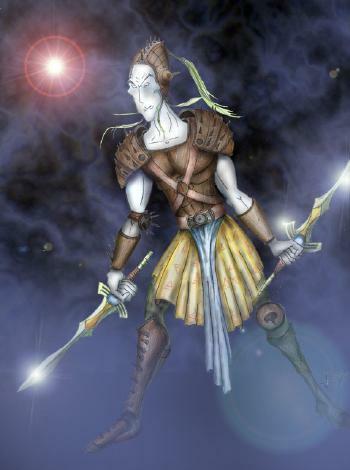 Martiken has studied and learned almost everything one possibly can relate to swordsmanship and planar travel, and his services as a guide are unapproachable. Chant goes that a few years ago, one of the Lords of the Nine sent out a small army to retrieve a stolen artifact. The artifact itself was of no true value, except to a small cult of paladins on Mount Celestia. But one of the fiend's lieutenants was rumoured to have leaked the real reason the Lord went berserk: he found the words "Marti was here scrawled" in his treasure chamber. The Athar explorer Burbank Ralopolis has been quoted as saying "I'd do almost anything to work with Martiken. Except pray." To hire him, one must first find him. The elusive and affluent tiefling, though, is difficult to locate. If Kylie owes you a favour, you can find him; the two are supposedly more than friends (though it may be a simple partnership; the two have access to inordinate amounts of information, so they might simply rely on each other for that). He's been identified at The Crazy Gith tavern talking to Magnum Opus, and some of her finds have been attributed to him (often to her chagrin). Her Musée Arcane is the only other haunt he has. Martiken likes to keep moving, and explore. His entire life is a mystery to all but him. The best way is to start up a game of cards in a seedy inn, and maybe a small man bearing two green swords'll approach you. He'll be pleasant, asking about your travels ask if you have any problems, and probably tell a few jokes. He just might help you. But you'll never know it's him.